Yaaaay…. 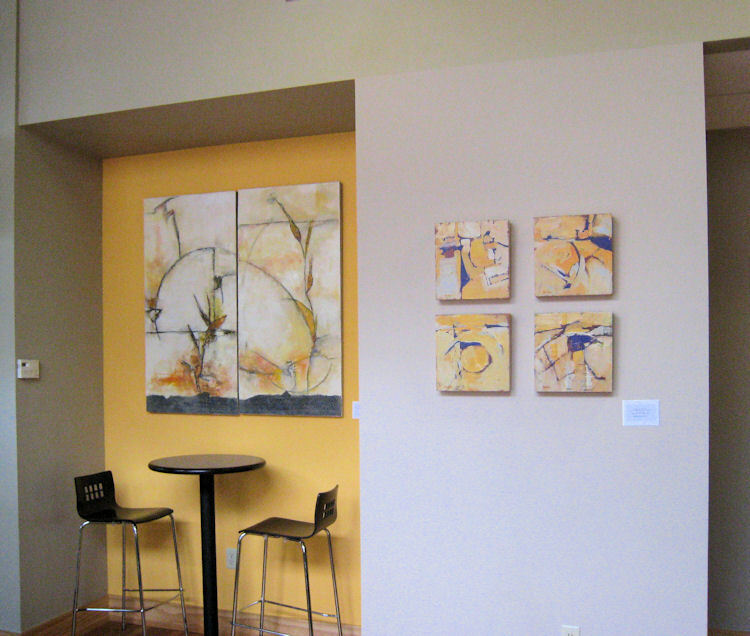 the work for the Downtown Coffee Lounge exhibit is now up. 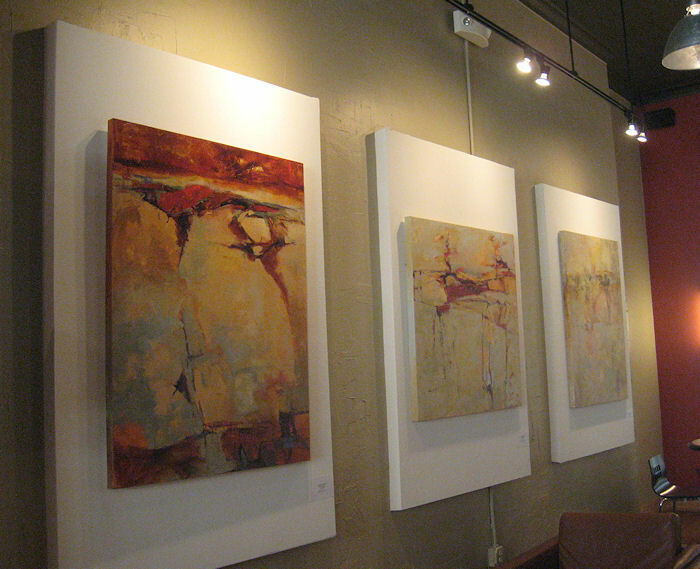 A million thanks to Gregory Zeorlin for asking me to hang work here in a lovely place dedicated to showing art. 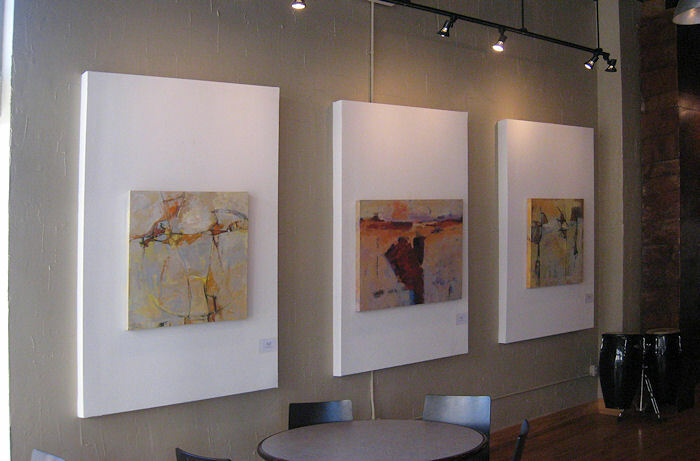 I have seven large paintings and four small ones on display through December 9, 2011. 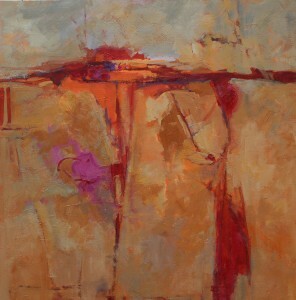 The artist reception will be tomorrow….200 W. Erwin, Tyler, TX……….. Thursday, October 27, 2011, 5-7pm. Please do come see the work and say hello. Gregory… a special thanks to you for climbing up and down to measure and hang the work. After a couple of days of painting and doing nothing but art related activities at Colony this time, I got ready to mix it up a little. This is usual for me. I go from large paintings on canvas, to smaller collages on paper… to hot wax encaustic painting. I try to keep my work looking like MY work but with a different medium and emphasis. 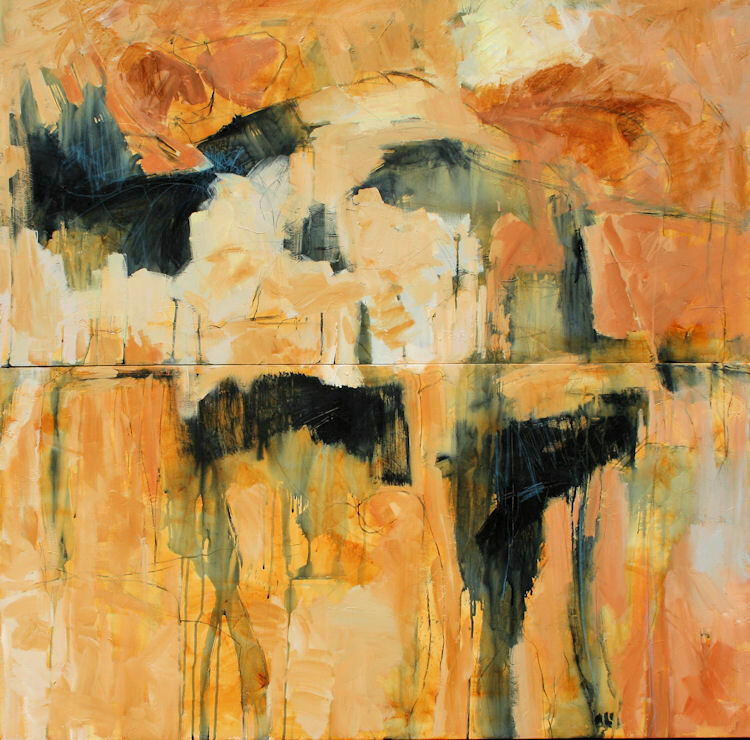 This time I was not looking to do away with the horizon line as I did when I was working on the “Meander” series of paintings………but what I got is still a version and continuation of that meandering. This time my take off point was to do some gestural, automatic drawing, both with drawing implements like charcoal, pencils and art crayons as well as a large well-loaded brush of dark paint. I prepped my canvas in the usual manner with lightweight modeling paste and chose a transparent yellow, Transparent yellow iron oxide. I didn’t have any black with me so I chose Payne’s gray for my dark paint. I just started with a 30 x 30 inch canvas on the first one. It’s hard to say what else I did as I was using some of the suggestions in a book I have and have not really used before………. 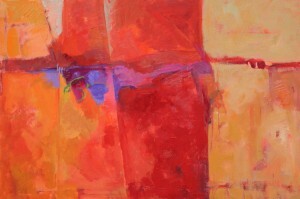 Steven Aimone’s, Live & Learn: Expressive Drawing: A Practical Guide to Freeing the Artist Within. This is the result of that first painting. I liked it. So, on to do another. I only had two 48 x 24 inch canvases left. 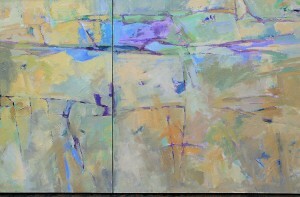 Since they would not go on my easel side by side, I used them as a diptych vertically…………same size overall anyway, 48 x 48 inches. I used much the same automatic drawing and painting but with a larger surface and different marks and gestures. This one might be my favorite……..at least for now. I’m back from Mississippi Art colony……all my gear is unloaded and in the studio although i haven’t yet unpacked all the paints. It was wonderful to see all my artist friends that I rarely see but twice a year. Generally, all I ever take is totally blank canvas. Knowing I was coming back to an ‘in progress’ diptych from me starting to paint over an old one, I decided to take them with me as well as the blank canvas. So, the first morning I set to painting and finishing this diptych… that only has a working title of Johnson Creek, Blue, green, violet. 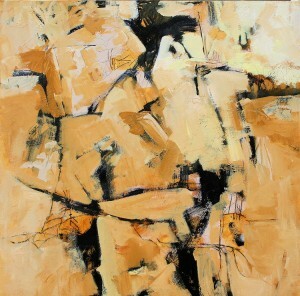 It is acrylic on two canvases, 36 x 60 inches total. After I set that one aside to work on a new painting…. this is what I am ending up with so far………acrylic on canvas, 36 x 36 inches……..Little Pieces of Land, with Magenta is the working title for now. The next one I worked on during the week was a piece I am still considering doing more to….line some drawing lines over the paint. Of course that will call for more paint back into the lines and so on and so on…. but here it is as it is right now. VERY colorful, for sure. I already posted it on FB during the week. 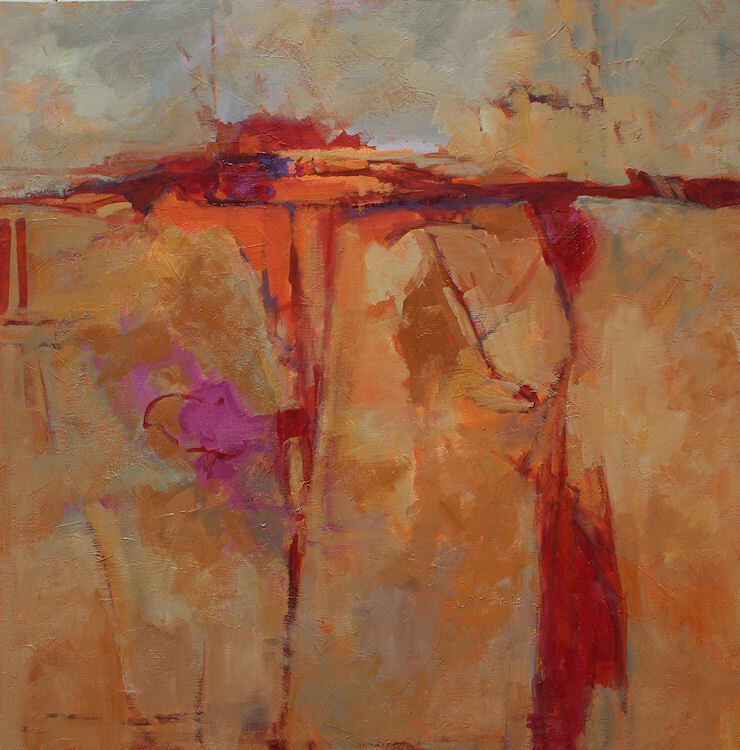 acrylic on canvas 24 x 36 inches….working title of Red-orange. I’ll post the next ones on the next blog post………. I was determined not to stay in a rut and got into some drawing exercises and had a lot of fun with them..
Until then, thanks for tuning in.